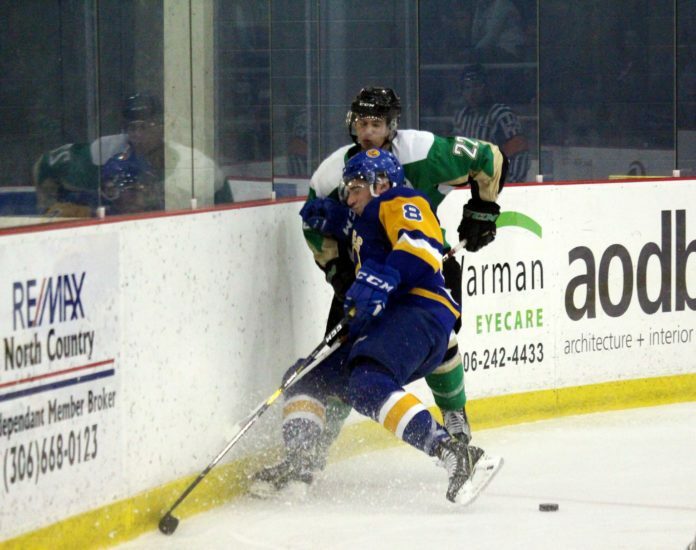 Lucas Punkari/Daily Herald Saskatoon Blades defenceman Seth Bafaro collides with Prince Albert Raiders forward Carson Miller Saturday night during a WHL pre-season game in Warman. With eight meetings during the course of the Western Hockey League regular season, it doesn’t get much for the Prince Albert Raiders and Saskatoon Blades to get riled up at one another. However, with four matchups taking place during the pre-season, a meeting on Sunday, Sept. 30 at the Art Hauser Centre might prove to be one of the most interesting contest in the opening stages of the 2018-19 campaign. The most recent meeting between the two sides, a 4-3 shootout win for the Blades at The Legends Centre in Warman Saturday, featured a much higher tempo and more physicality that had been present in the previous matchups between the two sides. That was most apparent in the first period of play, as Raiders defenceman Zach Hayes squared off with Blades forward Riley McKay in a tilt that saw both players head to the showers early as per WHL pre-season rules. Although a hard-hitting affair might not be what most observers expect in the pre-season, that could be a regular occurrence when the games count for real as both sides look to make noise in the Eastern Conference. 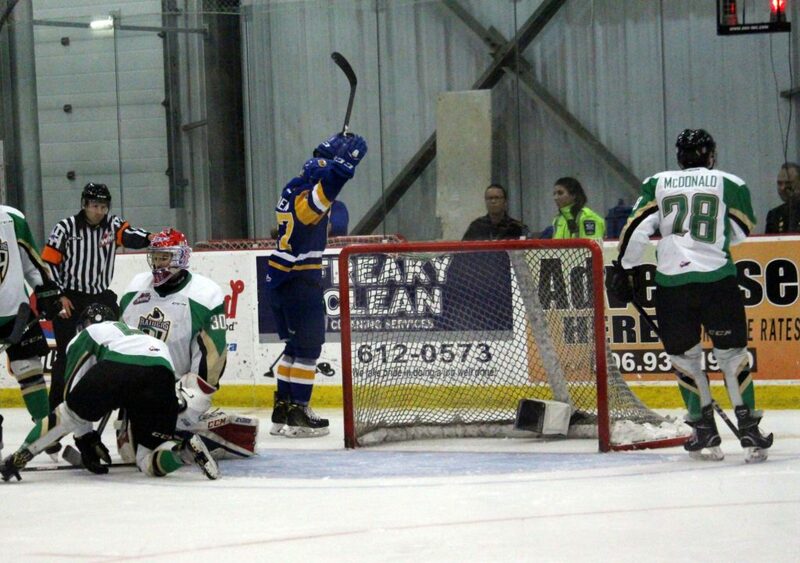 Saskatoon Blades forward Michael Farren celebrates after scoring a goal in the second period Saturday in Warman. As was the case Thursday in a 6-3 win over the Raiders in Prince Albert, the Blades’ top offensive trio were a dominant force yet again. Farren led the way in regulation with a goal and two assists, while his linemates Bradly Goethals and Kirby Dach had a goal and an assist each. Goethals and Farren also came up big in the shootout, as they each solved Raiders netminder Donovan Buskey in the skills competition to improve to 5-0 in pre-season play. “We actually didn’t play together a whole lot last season,” Farren said. “Kirby and I were with each other for a little bit, but Bradly and I didn’t team up at all. Koen MacInnes turned aside 35 shots in 65 minutes of play, but he saved his best save for the shootout as he stretched out his right leg to deny Raiders forward Brett Leason. Kody McDonald led the way for the visitors with a goal and an assist, while Lane Kirk and Moe also lit the lamp. “Before the game, ‘Habby’ (coach Marc Habscheid) really stressed to the older guys on making sure that we stepped up and I think we did that,” Moe said. Buskey made 33 saves for the Raiders, who now have a 0-3 mark in exhibition action. Prior to another meeting with the Blades in Prince Albert Saturday, the Raiders will travel to the Brandt Centre Friday evening to take on the Regina Pats. The Pats will be coming up to the Art Hauser Centre on Friday, Sept. 21 for the first game of the regular season.